By Inte Gloerich, January 26, 2018 at 1:57 pm . The Institute of Network Cultures is part of the EU-funded State Machines project, which investigates new relationships between states, citizens and the stateless made possible by emerging technologies. One of our partners in this project, the London-based gallery Furtherfield, published an impressive exploration of blockchain technology, not from the point of view of the newest start-up or an evangelical techno-libertarian, but that of artists, designers, researchers, and writers. Editors Sam Skinner and Nathan Jones will join us for the presentation of Artists Re:Thinking the Blockchain at the launch of the MoneyLab Reader 2: Overcoming the Hype in Amsterdam on February 22nd in Spui25. Here, I want to already highlight some of the discussions surrounding the blockchain that the book investigates from alternative points of view. When keeping up with cryptocurrency-developments through sites like CoinDesk there’s always a steady flow of input from economists, technologists, politicians, cryptographers, and businesspeople. The newest ICO, debates about block sizes, Bitcoins epic rises/crashes, China’s Bitcoin banking ban, etc. Business news as usual, infused with crypto-enthusiasm. White papers of new coins and other blockchain-based businesses are abundant in this space, but blockchain is not just about start-ups. Big corporates, like Deutsche Bank and IBM, are serious about using blockchains in their operations. On the political side, some countries have added a blockchain-based equivalent to their national currencies. These developments indicate that blockchain-based systems will not remain separate, opt-in economies, but are on a road to be immersed in the everyday experience of whole societies. Right now, what blockchain is or will be when it is implemented across government and big business alike, is still up for debate. If blockchain is to be the backbone of much interpersonal, corporate, and/or governmental interaction, it is important to inspect it from an individual user’s/citizen’s point of view. We need to learn about the implications and uses of the technology across all layers of society. Artists’ speculative projects around what the technology could be are especially valuable at this moment to delve into alternative visions beyond profit-based imaginaries. 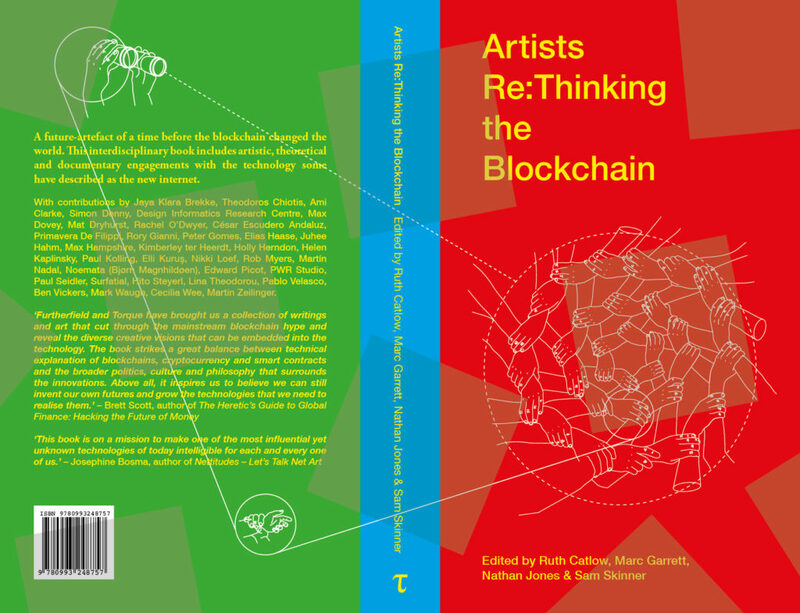 Artists Re:Thinking the Blockchain provides just that in its three sections: Documents (presenting projects that explore speculative trajectories for the technology), Fictions (imaginations of future realities in blockchain societies), and Theory (essays on the socio-political meanings of the blockchain, especially with regards to arts). Blockchain is often essentially used as a way to keep track of ownership without the use of a central authority. Because of Bitcoin’s fame, and the many coins that have followed it, the word ‘blockchain’ often seems to be a stand-in for ‘cryptocurrency’. But it can be much more, from identity tracking and copyright management to wedding registration or novel funding structures, and the collection of essays in this book highlights many of these alternative directions. Can blockchain be repurposed to make possible non-capitalist / community-based / commons-supporting ways of living? Can non-human life forms prosper on the blockchain? How can artists benefit from the blockchain? Does it allow for new revenue models or is it perhaps capable of democratizing art funding? In one of the opening essays in the book, researcher Primavera De Filippi presents her vision for self-propagating blockchain-based mechanical life forms. Her Plantoid consists of an artist-made flower installation and a smart contract on the blockchain. The former attracts audiences and invites them to make (micro-)donations to the artwork, and the latter sets in motion a mating ritual of sorts once funds are sufficient: an artist of the Plantoid’s choosing will be commissioned to make a new Plantoid, which will then start its own reproductive cycle. De Filippi’s work invites interesting questions of ownership, autonomy, and art funding: as the Plantoids commission work autonomously and form ancestries, the artwork becomes capable of making decisions beyond its creator’s direct intentions. Every parent Plantoid actually profits from its children, perhaps incentivizing diverse investments into artist-pollinators. Similar themes are considered in the terra0 project by Paul Seidler, Paul Kolling and Max Hampshire, where an augmented forest is capable of logging its own trees and ultimately owning and (if it so desires) expanding its borders. Imagining an augmented nature that can choose to engage in market exchanges on its own accord, never undermining its own wellbeing for short-term profit, is fascinating, and I look forward to further explorations of the question of the implications of who writes these smart contracts and how much depends on the character / biases of the writer. Can nature emancipate itself from the oppressive force of humanity while using our tools? What is the closest it can get? Projects like Imogen Heap’s Ujo (which uses Etherium to license music and pay out revenues automatically to rights holders) and Ascribe (‘an ownership layer for the internet’) use the blockchain to rethink copyright and rights holder payment structures and are referenced throughout the book. Curator and writer Helen Kaplinsky takes an interesting approach to this topic by looking at the colonial history of the museum, the institution’s valuing of individual authorship and ownership, in the context of blockchain-facilitated authentication of art works. She writes that the blockchain is prone to replicating a colonial worldview through its insistence on Western values like individuality and authorship. Researcher Rachel O’Dwyer goes on to question whether copyright is at all a fruitful direction for culture on the blockchain. She sees three futures for cultural products using blockchain technology to facilitate revenue models. Arguing that it is unlikely that there will ever be a system that absolutely excludes illegitimate copying of digital material, and thus authenticity or payment based systems will always be flawed, she speculates that the third option will be the most likely to occur: the monetization of user / spending / circulation data. Restrictions on copying would disappear, content would be able to flow ever more freely, in return for the unlimited tracking of data that this content and its users produce. This model in itself is nothing new, but questions of pseudonimity on the blockchain and the desirability of being able to (legitimately) use coins and content anonymously become increasingly important. These are just a few of the many insightful, surprising, and / or amusing articles featured in Artists Re:Thinking the Blockchain. While blockchain is famously hard to grasp fully, and a book with ‘rethinking’ in its title might give you the impression that you need to be familiar with the basics already, the introductions and first few articles actually give very digestible yet precise descriptions and discussions of the issues surrounding the technology (I found especially Martin Nadal and Cesar Escudo Andaluz’ piece on critical mining very informative). Overall, the book presents a perspective on the blockchain that is enticed by the technology, enthusiastic about its potential but at the same time cautious toward it, and critical of some of the directions it’s been taking into. Reading it has been an entertaining journey into exactly this space of alternative imagination. Artists Re:Thinking the Blockchain at Liverpool University Press. See Brett Scott’s article in the MoneyLab Reader 2: Overcoming the Hype for more on this.